This is the detached annex to Tenkyokaku, which was built in 1922 as a summer villa for Princess Arisugawa Yasuko. Please wait for new news items to arrive. The Fukushima Geihinkan is a Japanese-style building constructed as an annex to Tenkyokaku, the Imperial vacation residence. 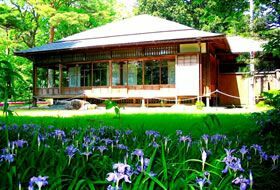 Former Okinajima Villa of Prince Takamatsu (hereinafter referred to as the “Villa”) was built in 1922 by the third son of the Taisho Emperor, Prince Takamatsu Nobuhito as a summer villa for Princess Arisugawa Yasuko. Tenkyokaku had been built 14 years earlier in 1908. 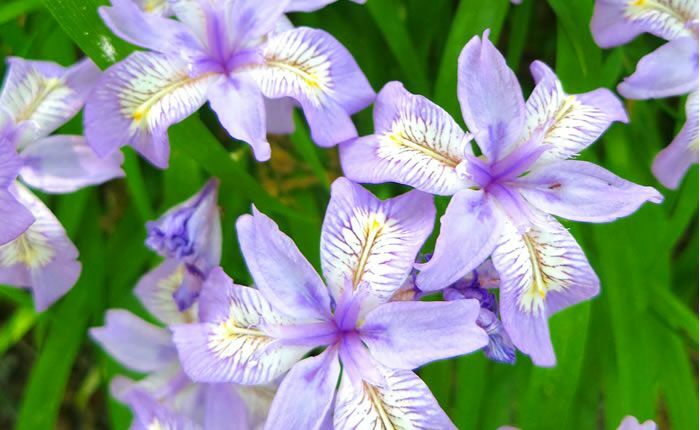 Prince Nobuhito built this secluded Japanese-style villa, with beautiful nature as its garden, with Princess Yasuko – who was approaching her 60th birthday – in mind. A peaceful place with deep ties to the Imperial Household. After its completion, Princess Yasuko spent the hottest part of the summer of 1922 resting at the Villa. Tenkyokaku and its annex were later visited by Emperors Hirohito and Akihito, as well as many other members of the Imperial Household, and have a deep connection to the history of the Imperial Household. 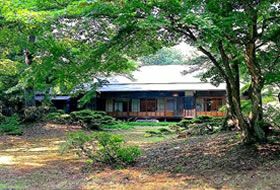 In addition, the Former Okinajima Villa of Prince Takamatsu was bestowed upon Fukushima Prefecture along with the Western-style villa (Tenkyokaku) in December 1952 by Prince Takamatsu, and is now referred to as the Fukushima Geihinkan. In light of the building's careful and sturdy construction, the sophistication of its design, and its architectural and cultural historic value, the Fukushima Geihinkan was designated by Japan as an Important Cultural Property in May 1999. 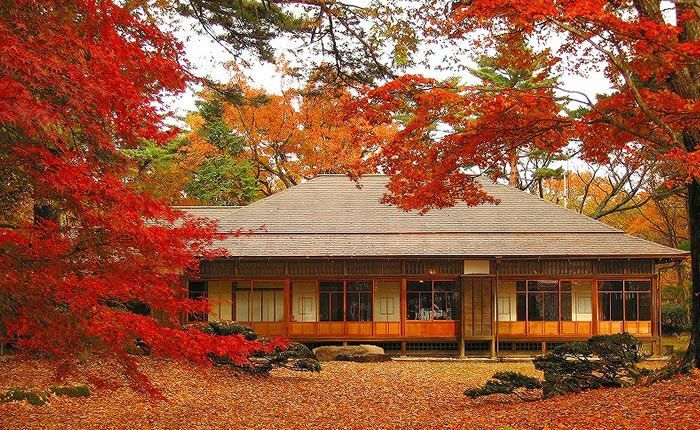 The Fukushima Geihinkan is a rare example of imperial villas built in the style of traditional Japanese homes. 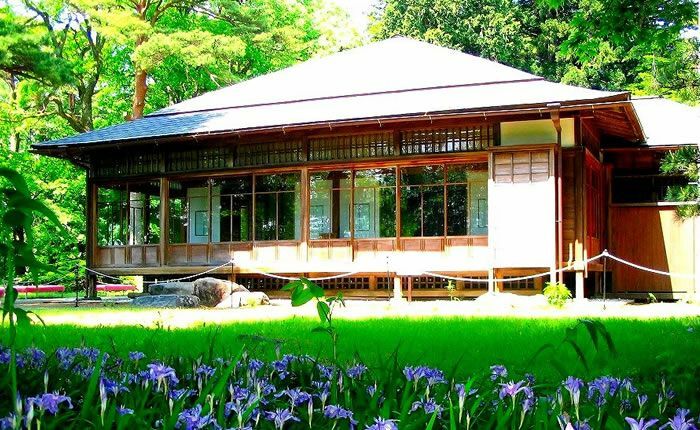 Fukushima Prefecture is preserving and protecting the villa and has opened its garden to the public to pass on its valuable cultural legacy. In addition, it is sometimes opened during special limited periods to present the value of this Important Cultural Property. This 589.7㎡ (178 tsubo) single story, wooden structure tells in its entirety of upper class aristocratic and samurai residences in the Edo Period (1603-1868). Each individual structure was built carefully and sturdily with a sophisticated design and refined elegance suitable for the resort of a princess. The buildings were built mainly with cypress as well as a number of other valuable woods, including cedar, Japanese red pine, zelkova with straight and figured grains. The designs of the main rooms include elements that add elegance to the interior of the building, such as the nail head covers, catches of the sliding doors, and other fixtures comprising of expensive metal fittings. 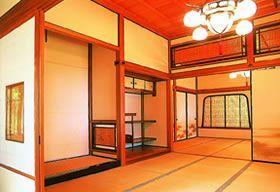 In addition, the techniques used in the Toko-no-Ma alcoves, Toko-Waki alcoves, ranma partitions, drawing room, veranda corridors, and glass-windowed sliding doors, are nothing short of works of art. The ranma partitions located in the uppermost level of the central corridor daintily welcome guests. The ranma partitions are adorned in Wajima lacquer from the Princess’s hometown. Composed of two rooms: upper and lower. The linear, natural beauty of the four-directional grains of the cypress draws out the hand-crafted beauty of the ranma partitions above the room divisions and the contours of the doorframes. 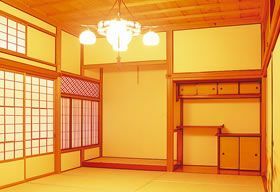 The ringed curves of the wood used in the Toko-no-Ma alcove and the moldings on the kato-mado (bell-shaped window) and fittings have a feminine shape to them. This resting space served the function of an inner-chamber living room. As in the Matsu-no-Ma, the walls are papered with Minogami paper and are battened. This battened frame, along with the ranma partition frame, floor edging, and sliding paper door edging, are all coated in vermillion lacquer. These elements together with the modest, simple drawing room, were thought to render the space suitable for a woman's study. Built in the style of a sukiya (Japanese teahouse). 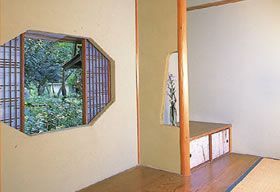 The window placed in the wall and the underground window design are all part of Princess Yasuko's private quarters where she pursued the wabisabi simplicity of the world of tea ceremony. Get off the Ban'etsu West Line at Inawashiro Station. From the station, take the Bandai Toto Bus heading for Kin-no-Hashi, Aizu Recreation Koen. Get off at the Nagahama bus stop. The bus journey takes approximately 15 minutes. From Nagashima bus stop. Tenkyokaku is a 5-minute walk. Take the Ban’etsu Expressway and exit at the Inawashiro Bandai Kogen I.C. 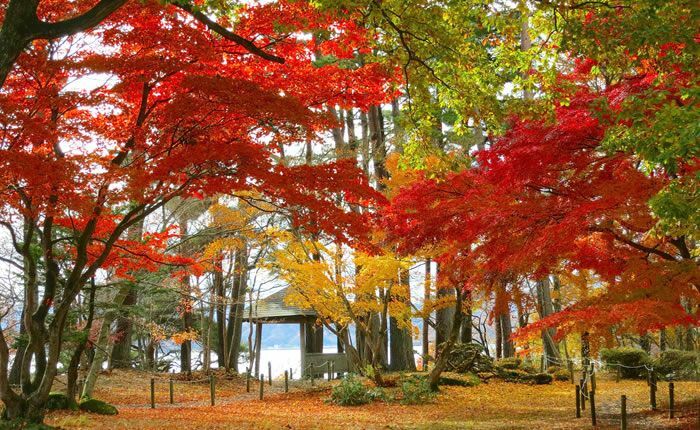 Then take National Route 49 towards Aizuwakamatsu for approximately 8km. Take the Ban’etsu Expressway and exit at the Bandai-Kawahigashi I.C. Then take National Route 49 towards Koriyama for approximately 11km. The Fukushima Prefecture Tourism & Local Products Association.